"Don't feed the fish." That's right, they're here to feed us, not the other way around. Education is critical to growth, no doubt about it. But when its purpose and practicality are lost to prestige, you know the system is faulting. That’s how I see the current Iranian academic education system and the subculture surrounding it. In this post, I intend to describe its flaws and their underlying reasons in hope of enlightening the participants, if not the people responsible. Who Am I to Criticise? Many people believe in the academic process in my country. Like the criticism of any well-established system, I expect this too to be met with resistance. To drop possible guards, allow me to explain the background I come from. First and foremost, I come from an academic family. My parents were both students when they had me. As I grew up, they climbed the academic ladder. In fact, I owe my introduction to English to the time they spent studying for their doctorates in Manchester, UK. Thereafter I witnessed firsthand their life as professors and learned of what transpires in their workplace. Next is the fact that I was an elite student myself. If Iran had an Ivy League for engineering majors it would consist of University of Tehran (UT), Amirkabir University of Technology (AUT) and Sharif University of Technology (SUT); students from elsewhere might argue in favour of their university, but even they would accept two and bargain for the third spot. I received my bachelor’s from UT and later on, got into AUT for my master’s. I think that proves I know what a top university looks like. Lastly, the majority of my English classes focus on TOEFL and IELTS. Anyone who’s preparing for these exams is thinking of continuing their studies abroad. In most cases, my students belong to top notch universities, though I’ve had all sorts. Since I work with them up close to ensure they achieve their goals, I have a good idea of how their universities go about their affairs. Traditionally, a small percentage of Iranians had the opportunity to study in school. And they weren’t even real schools. The maktab or maktabkhaneh was where everyone looking to learn gathered in the same humble class. The teacher was often the town literate who taught reading and writing off the Quran and maybe even some basic science. That changed when the French education system was adopted in the Qajar era and the foundation of modern schools. It’d be unfair to say they haven’t changed much over the centuries, but they bear some resemblance. In my era, you had to study for 11 years to earn your diploma. But that wasn’t enough to secure a seat in university. Since 1969, all students seeking admission to government-funded universities have gone up against the frightening konkoor or the Annual Nationwide University Entrance Exam. This monstrosity tests students on all they learned in school based on their major: mathematics & physics, experimental sciences, art, humanities, and foreign languages. Sure, they had another year to review their lessons and hone their skills for the plethora of multiple choice questions ahead. But that’s not all. They also have to attend a pre-university year at school to learn more. Plus, with one’s academic fate resting on a single exam, the stakes are high.Getting a good rank in the konkoor is no easy job. But let’s say someone ranked well. What then? Depending on their rank, they can choose a collection of majors in universities and hope for an acceptance letter. Another bug in the system is the basis on which students choose where and what they want to study. With little or no exposure to an academic environment, school graduates base their decision upon inadequate information. Instead of making informed decisions for fields of study and work that will affect their future, they’re deceived by trends and hype. A university degree is something to be proud of. After all, you’ve learned 140 credits worth of courses and passed them successfully. But it’s not just you who’s proud. The family love to remind people their child is a graduate and show off. That’s why the title the major brings with it is important. It’s much cooler (and easier) to be called doctor and engineer than marine biologist. Believe it or not, that’s actually a major factor. It’s joked that many medical students start calling each other “doctor” from the very first semester. Unfortunately, it’s true. Talk about an inflated ego. Valuing doctors and engineers has another implication. It devalues other groups, at least in the eyes of many concerned parents. One look at a paycheck is enough for a father to sit his son down and explain to him why he shouldn’t pursue art. The significance of a midwife’s work may fade when a mother insists to her daughter that if she studies “a bit more” she can be a doctor. Passion and talent don’t play much of a role. Schools are to blame too. For instance, NODET (National Organisation for Development of Exceptional Talents) only admits students for mathematics & physics and experimental sciences. Can’t you do art and be smart? According to official statistics, the number of participants in the experimental sciences group versus mathematics & physics in the 2017 konkoor was roughly 520,000 to 160,000. It’s normal to have more in the former group that can go on to become doctors, dentists and pharmacists, among other careers. But compared to 10 years ago, the proportion has shifted from 4:3 to 3:1. Why? Because nowadays it’s widely believed that’s where the money is. The trend is irrational: first, because the long and strenuous training time (as opposed to other majors) is neglected; and secondly because by the time this surge graduates, there’ll be more supply than demand. Imagine their disappointment after 7 years when they realise there’s no fortune awaiting them. Bustling in their tiny aquariums, this school of fish remind me of the hollow competition in our schools. In all honesty, my decision wasn’t wiser than most. I ranked high enough to have plenty of options to choose from. At the time, engineering was “in”. I chose University of Tehran over Sharif University because the latter seemed to offer a limited experience and produce very square students; that was more or less true, but my preconception was exaggerated. For my major I opted for electrical engineering as it was widely believed to be the hardest and therefore, the “best.” Quite early on I realised it wasn’t cutting-edge nanotechnology I had to deal with but rather a lot of math and physics. I was stuck in a mess I had waded waist-deep into. I didn’t gain much from my study, but it did prompt me to go down many different alleys. I’m grateful for the life experience but surely there are easier ways. Experiments and workshops require equipment or in other words, money. Classes cost much less. Perhaps that’s why the academic curriculum emphasises lectures and barely manages to squeeze a few practical courses in. Most classes consist of 1.5-2 hours of a teacher talking away twice a week and the keener students transcribing it. The lazier ones borrow and copy their friends’ notes shortly before the exam and study the night before. Sometimes it works, sometimes it doesn’t. The lame part is there aren’t enough opportunities to put what you’re learning into practice. Architects and doctors don’t necessarily fit that description though. As the end of a semester draws close, students have one big concern: passing their courses. Even in public universities where students don’t pay for their credits, getting a good mark matters. A 10/20 score will do the job, but if your average drops below 12 you’re put on “conditional” status (+2 for master’s on passing and average). That means you can’t take as many courses next semester, effectively prolonging your study period. So students have evolved to analyse the exam itself and direct their studies at answering the possible questions they may come up against. It’s stressful and detrimental to actual learning. Trust me, you don’t want to get on a professor’s bad side. While most courses are offered with several professors, some are exclusive to one. Teachers have their unique methods and if you don’t like it, it’s best to bite your lip and keep to yourself about it. Imagine being stuck with a teacher who took a disliking to your critique? 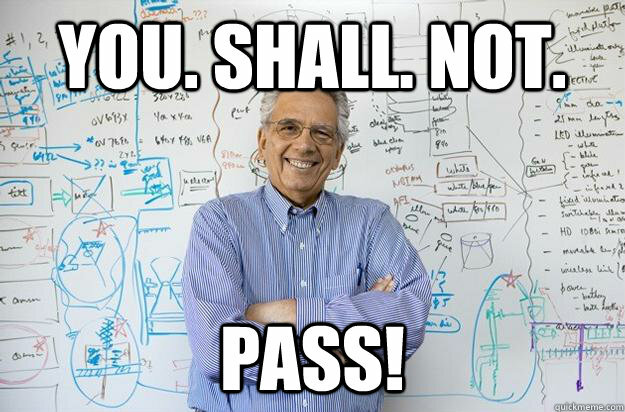 If the course is a prerequisite, you’re going to have a hard time convincing him to let you pass. Iran is generally a bureaucratic country. That means you’ll feel yourself getting older before you get through paperwork for any process. Whether you want to drop/add a course, take a temporary leave or receive your diploma, you’d better prepare yourself mentally. Recently, most institutes are turning to electronic systems which is helpful, unless the nice lady in the administration office is new to it and not too keen to learn. In that case, you’re already past the point of no return and you didn’t even know it. There was a time when a diploma equalled success in the Iranian society. Illiteracy rates were sky high and completing school qualified you for a good job. Later, fighting your way through the konkoor to earn a bachelor’s served the same purpose. Those were the good old days. As more people enrolled in schools, the minimum requirement for a job was raised from diploma to bachelor’s and in recent years, master’s. It doesn’t take a genius to realise soon none of those will suffice and only PhD degrees will count. But does all that study fulfil the promise for a brighter future? Unemployment rates are tragically high in Iran. In contrast, the number of graduates universities are pumping out is at an all time high. With the unprecedented increase in private universities that admit pupils without an entrance exam, more and more people are getting degrees. I’m not even going to go into the fact that some institute hand out instant degrees in return for money. A degree simply doesn’t have the same value it once had. So many seemingly trained individuals and yet, such a small portion employed. Why you might ask. The answer is simple: university and industry operate independently, even regardless of each other. Universities aren’t training their students for the workforce, forcing many employers to retrain the newbies. While they’re rich in terms of theoretical knowledge, most students haven’t a clue regarding what to do in the field. Suffice to say that as a fifth-year electrical engineering student, we were instructed “not to touch anything electrical” in the workshop. Long long ago in a magical land, a small village was plagued by dragons. In hope of saving the lives of the village folk, a group of the strongest and smartest set out to find a solution. They came across a dragon-slaying school which promised to teach them all there was about fighting these fire-breathing creatures. After years of training and learning, they returned to their village only to find all the dragons had passed away. What could they do? Let all their hard work and study go to waste? They had only one option: start their own dragon-slaying school. Most top students end up back in the university, within or without Iran. They keep studying because that’s what they do best or in some cases, it’s the only thing they’ve known. The normal students either go abroad in search of a better future or stay to find a job, any job. I think I’ve seen more people working in jobs unrelated to their background than related. That might be true about the weaker students too, but if they’re smart they get a headstart. Why not spend my time working during school if that’s what I’m going to do after it anyway? I don’t want to come off as a pessimist because I’m not. Things aren’t all bad. Schools are less strict than they were back in my time. Even then, they produced some of the smartest students a system could hope for. Interestingly enough, women make up the majority of the student body by 60%. Universities in Iran have a high graduation rate and they’re doing quite well on an international scale too. Every year hundreds of Iranian graduate move abroad to continue learning in European and North American institutes. The end result is acceptable, but there’s room for improvement. One of the major changes I hope to see is people pursuing what they like instead of what they think will “work.” I know it sounds cliche but if more individuals followed their hearts, we’d have a better society. Instead of going after money and prestige, they’d enjoy striving for something of personal value to them. That might require them to stand up to the old mindset that says “you’re only going to be successful if you become an engineer, doctor or lawyer.” It might mean they’ll face difficulty and uncertainty as an artist, linguistic analyst or some other unconventional career. But it’ll be worth it. We enjoy the ups and the downs when we there’s a purpose behind it. The university could make positive changes too. If they found ways to evaluate their attendees that relied less on midterm and final exams, students could focus on their learning rather than the grade they’re going to receive for it. After all, learning should be fun and fruitful. Why not introduce a younger generation of professors that can relate to students? I remember everyone loved it when the prof showed he had a life outside the university and allowed the same for his students. I hope I haven’t painted too dark of picture of Iran’s academia. University is an important stage in development as a scholar and person. I know the academic society is trying and I don’t think it’s them alone who need to change. A profound change is needed in the way we view education collectively and I believe it has already begun. We’ll know in a few years whether I’m right or not. What are your views on Iranian education? Is it in need of some revision or do you disagree with me? Share your opinions, maybe it’ll teach me a thing or two. You are awsome. What if the men in charge of making decision on these important issues had your profeciency and viewpoints. Thanks 🙂 If they did, we’d have a slightly better education system. But it takes the wisdom of many to make drastic change, not just one.